For months, the researchers and developers at Labrada Nutrition have been hard at work, in partnership with fitness icon Jamie Eason, developing an exclusive line of natural supplements made specifically for women. From the moment word got out about this new signature line-up, our website and social media pages have been buzzing non-stop. Loyal Labrada and Jamie Eason fans alike have been waiting anxiously to learn what happens when two great names in fitness finally team up! In early discussions of this new product line, one thing was certain: a delicious, wholesome, and high-quality protein powder would be first on the development list. After all, every fitness-minded woman needs a protein supplement that not only works, but tastes great! At last, that product is here. 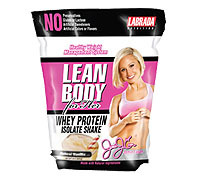 Labrada Nutrition is proud to introduce you to Jamie Eason’s new Lean Body® for Her Natural Whey Protein Isolate. Why Choose Jamie Eason’s Lean Body® for Her Whey Protein? Most fitness enthusiasts will agree that a high quality protein powder is a staple in their diet. Jamie has supplemented her diet with protein powder for years and this has contributed greatly to her ability to stay in great shape year round. Although staying in great shape takes consistency and commitment to exercise, it also takes proper nutrition to serve as fuel to reach your goals. While it's certainly important to consume lean protein from sources like eggs, chicken breast, turkey or tofu, none of these are as fast absorbing as a whey protein isolate. What does this fast absorption mean? It means that after a rigorous workout when your muscles are starved for sustenance to help them repair and grow, they’ll get the nourishment they need more quickly than from other slowly digested proteins. So, Jamie Eason’s whey protein isolate is a great way to ensure that you have the protein you'll need for muscle recovery – fast – to help maximize the results of your workouts. Why is Lean Body® for Her Natural Whey Protein Isolate a great choice for you? Lean Body® for Her Natural Whey Protein Isolate contains the finest and purest ingredients, so you can be sure you’re getting the very best grade of complex whey protein possible to nourish your body. Not only is whey protein great post workout, it’s also great to use throughout the day to stabilize blood sugar and suppress food cravings. Whey protein helps you to stay fuller longer, so it satisfies your appetite. 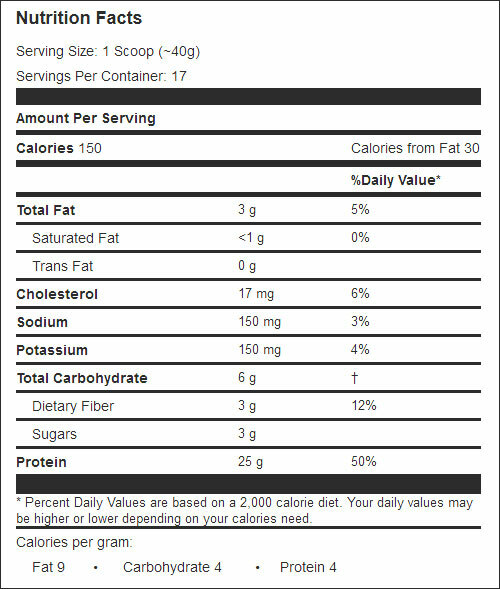 See below in the “What’s In It Section” is a full list of ingredients that make up the delicious, all-natural Lean Body® for Her Whey Protein Isolate formula. While some protein supplements contain just 30% to 40% of whey protein and high amounts of lactose, fat and lower-grade proteins, we've ensured that there is no gluten, lactose or filler ingredients in our formula. Lean Body for Her Natural Whey Protein is a clean source of fuel for the body with excellent bioavailability (rate of absorption) and is devoid of saturated fats and empty carbohydrates, so your body only gets what it needs. Labrada supplements were developed to help you reach your goals of achieving a healthy and fit body for life. With that in mind, things like convenience and portability are important, and that’s why we designed Lean Body® for Her Natural Whey Protein Isolate in an easy, re-sealable bag. It won’t take up a ton of cupboard space like some protein jugs do, and it’s easy to get to (and travel with) when you need it on the spot. You’ve also got three easy mixing options – in a glass, in a shaker bottle, or in a blender. So, wherever you are, wherever you are, Lean Body® for Her Whey Protein Isolate will fit your lifestyle. WHAT'S IN WHEY PROTEIN ISOLATE? Vanilla: Cross-Flow Micro Ultrafiltered Whey Protein Isolate, Sunflower Oil, Calcium Caseinate, Inulin (Chicory Root), Organic Cane Sugar, Natural Flavors, Xanthan Gum, Sea Salt, Monkfruit Extract. Chocolate: Cross-Flow Micro Ultrafiltered Whey Protein Isolate, Sunflower Oil, Dutched Cocoa, Calcium Caseinate, Inulin (Chicory Root), Organic Cane Sugar, Natural Flavors, Xanthan Gum, Sea Salt, Monkfruit Extract. Fill shaker with 5-6 oz. of water of your favorite beverage. Add 1 scoop (~40g) of Lean Body® for Her Whey Protein Isolate Shake. Cover and shake.